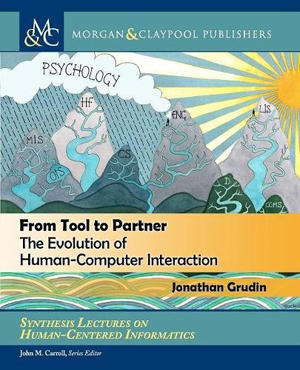 I want to use this blog entry to publically thank Jonathan Grudin both personally and on behalf of the larger HCI community for authoring From Tool to Partner: The Evolution of Human-Computer Interaction. His recently published book fills a long-standing gap in our professional narrative by providing a written history documenting how the multidisciplinary nature of our profession coevolved with the technology mega-trends of the last 60 years. For me personally, reading From Tool to Partner felt like fondly flipping through decades of family photo albums, while at the same time finding connections and patterns that I never realized existed or never understood the origin of before. My entry into the field of Human Factors began in 1981 and I remain an active participant as an adjunct professor in San Jose State’s graduate program in HF/E following a 35-yearlong HCI-focused industry career. I first met Jonathan at MCC, the American 5th generation project mentioned in chapter 7. My employer at the time, Eastman Kodak, was one of the sponsoring organizations and I was their representative to the HCI program track where Jonathan was on staff. I have belonged to many of the professional organizations discussed in this book and attended many of the early conferences mentioned, the most seminal of which for me was the first Interact conference (1984) in London. In addition, I am a chapter co-author of the first Handbook of Human Computer Interaction (Helander Ed., 1988) mentioned in chapter 8. While I could lend my own perspective on the evolution of various HCI organizations, their politics and conferences, academic refocusing, and the technical milestones that Jonathan meticulously chronicles, for this blog that is neither needed nor appropriate. Suffice to say, based on my own journey this book appears to be quite accurate and it was clearly painstakingly researched. Jonathan covers the progression of HCI from expert use on early mainframes to the discretionary use of personal apps, powered by the cumulative effect of Moore’s law. To date, this has resulted in the mobile experience now dominating the market and in the foreseeable future to be replaced by ubiquitous embedded computing. He pays tribute to our founders J.C.R. Licklider, Douglas Engelbart, Ivan Sutherland, and others, documenting their amazing vision while articulating both when, decades later, we have finally achieved that vision, and where we still have a significant distance to traverse. Like the author, I offer no target date for the singularity. This is still the realm of science fiction in my opinion. One of the most illuminating aspects of the chronological narrative presented is the timing when the various disciplines of Human Factors, Computer Science, Library Science, and Design entered the mainstream of HCI practice and how they affected our shared trajectory. A particularly salient recurring theme in the book is the decades-long tension between the fields of AI and HCI. As noted, funding ebbed and flowed for AI research through numerous periods of “summer” followed by the “winter” of unfulfilled, overhyped promises resulting in huge budget cuts. When AI was down in the dumps, money and talent flowed into HCI research and vice versa. We are now in the middle of the 3rd AI summer, with autonomous vehicles playing the poster-child role in the media. For those newer to HCI professionally From Tool to Partner will obviously not invoke the same nostalgic reaction it had upon me. But most importantly the words of the philosopher George Santayana apply. To wit, Those who cannot remember the past are condemned to repeat it. For skeptics who might think the Santayana quote is not applicable to HCI (and just another nostalgic detour on my part) let me provide a recent concrete example. Last year I undertook a consulting engagement to help a Silicon Valley startup productize an innovative Chat-Bot technology. Chat is “the new paradigm,” they told me. The history of HCI tells us this is not so! There is a significant HCI literature on command language interaction that was directly applicable to the usability problems manifested due to the lack of a consistent grammar both in the design tool for scripting conversations, and in the executable result when users encounter a Bot instead of a human to assist them in finding their lost luggage or replacing a missing ticket. It turned into a short consulting engagement because the boost provided by knowledge from HCI history was a major benefit to this startup. If they had taken a trial and error approach to refinement (another topic Jonathan points out the flaws with) instead of leveraging prior HCI knowledge, they would have run out money long before bringing a viable product to market. One of my goals at SJSU has been to introduce a course on HCI history into our program. I believe this will support our graduates in becoming more efficient and effective user researchers and designers. And it will provide a calming counterbalance to the turbulence they will surely encounter over their careers as the ever-accelerating pace of technological change continues. And now, thanks to Jonathan I have a textbook I can submit to the university curriculum committee that proves that the field of HCI history exists!